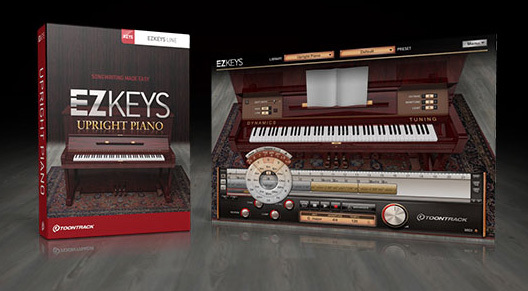 EZkeys Upright Piano, Virtual Acoustic Piano from Toontrack in the EZkeys series. 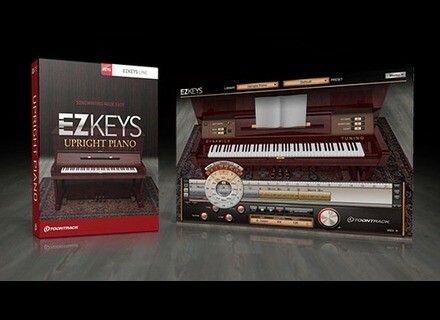 Toontrack has released EZkeys Upright Piano, a new plug-in sound library of a sampled Östlind & Almquist piano. The EZKeys plug-in / application has been updated to version 1.1, which is required for EZkeys Upright Piano to operate, and introduces several new features including the ability to record MIDI directly to the timeline so you can add your own melody to an existing chord progression. EZkeys can also now 'humanize' any pre-quantized MIDI upon import. Drag and drop single chords from the Chord Selector to the timeline or to the favorites section. The user can now let EZkeys 'humanize' any pre-quantized MIDI upon import. Use your own chord progression and transform it with playing styles found in other MIDI files. Added support for smooth scrolling on Mac with trackpads and similar. Record MIDI directly to the timeline in EZkeys. Add your own melody to an existing chord progression. Alter the voicing of a chord on the fly by clicking the - or + buttons. Paste Chords, MIDI or both. It is now possible to choose if you want to paste only the chord progression, only the MIDI or both. EZkeys is run in DEMO mode until authorized (no demo version). Export songs or files as wave files straight from the EZkeys interface. Priced at £111 / €139, EZkeys Upright Piano is available for 32- and 64-bit Windows and Mac OS X in VST, AU and RTAS plug-in instrument formats as well as a low latency stand-alone application. Users who already own EZkeys Grand Piano and want to buy Upright Piano can do so for £54.95 / €69.